Dragon Rouge London's Briony Stokes on the highlights of her two month exchange to Dragon Rouge New York. I’ve worked at Dragon Rouge for almost 3 years now and have always been interested in visiting some of our other offices. When the opportunity arose for me to spend 2 months in the New York office I jumped at the chance. Having never been before, I was excited, nervous and eager to experience what life was like in one of the world’s most famous cities. After a very British send off in our local pub, I hopped on a plane and 7 hours later I arrived on a hot summer evening in Manahattan. During my 2 months I made sure to pack in as much as I could but I won’t bore you with the hundreds of photos (if not thousands) I took, so here’s a shortlist; the top 5 highlights from my trip. 1. On my first weekend, I headed straight to the High Line. One of New York’s newest parks, the High Line is built on a disused railway and runs through the Chelsea and Meatpacking district. A perfect place to get my bearings, see some great views and soak up the art and architecture. Chelsea Market is situated underneath the High Line and is an amazing indoor food market built in the former Nabisco biscuit factory where the Oreo was invented and produced. 2. The galleries and museums in New York are world-renowned for a reason – using the office’s membership cards I was able to visit the Whitney gallery and MoMA for free. 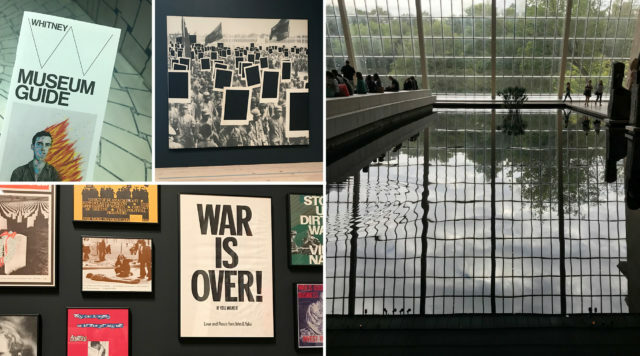 Highlights include seeing famous works such as Van Gogh’s The Starry Night and Monet’s water lilies at the MoMA, but it was also great to see other new exhibitions such as the display of political protest artefacts at the Whitney. The MET was also incredible with it’s huge selection of art, sculpture and historical artefacts from all countries and eras – plus a great view over Central Park. 3. The food! 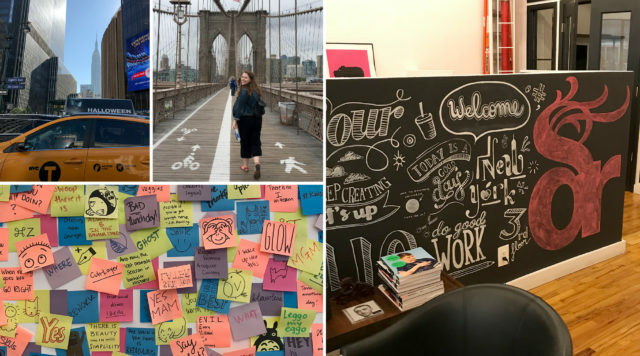 I can’t talk about NY and not mention the food – the NY team made sure I was well fed during my visit, and were determined that I sampled a breadth of cuisines from the American classics like bagels, doughnuts, pizza and burgers (healthy..!) to authentic Mexican and Italian dishes. The corned beef sandwich from Katz deli (from the famous scene in When Harry Met Sally) was also a highlight. 4. 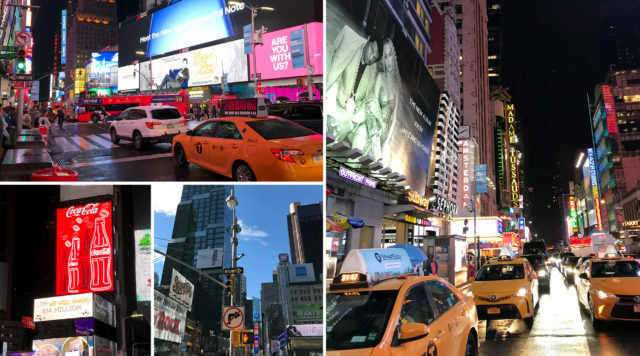 I’d heard mixed reviews about visiting Times Square so wasn’t quite sure what to expect; I went on a Saturday night and whilst it was very hectic, noisy and busy, it was definitely worth a visit. From a branding point of view, it was amazing to see such a concentration of iconic brands and their communications constantly animating and lighting up the streets below. I’d seen nothing like it before, Piccadilly Circus just doesn’t compare. 5. Walking over the Brooklyn Bridge was something that lots of people had recommended and it didn’t disappoint. The views from the bridge were incredible, and the bridge itself was very photogenic too. 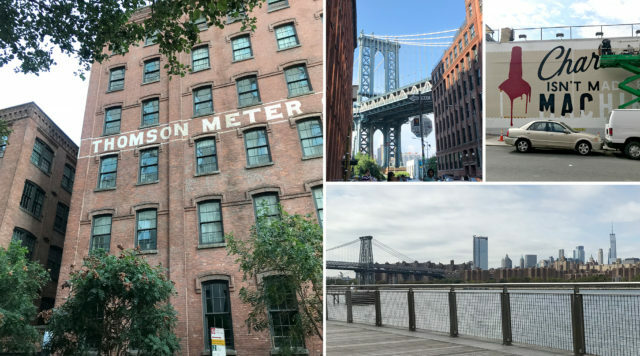 Once in Brooklyn, I visited Dumbo and explored the shops along the waterfront. It had a different vibe to Manhattan, much more artsy and laid back. It was also the best place to get a good view of the iconic skyline.